Golden Key International Honour Society 2016 offers unique scholarships, awards and grants to members, alumni and advisors all over the world. Below are the scholarships currently open for application. Please check back regularly as scholarships are added throughout the year. Golden Key has awarded over $12.5 million dollars in scholarships and awards since 1977 to deserving Golden Key members. -This award recognizes Golden Key members for their excellence throughout their undergraduate careers. - Emphasis will be placed upon academic excellence and how this individual lives out the values of Golden Key on a daily basis. - Must be a current active undergraduate member on April 15th. - GPA minimum of a 3.5 out of a 4.0 scale, or international equivalent. 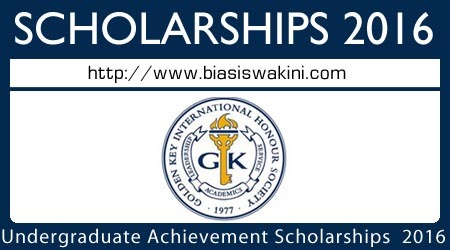 - Multiple $5,000 (USD) scholarships will be granted. 0 Komentar untuk "Undergraduate Achievement Scholarship 2016"